As I’ve discussed previously, 3D models of morphological data are becoming commonplace and natural forms of disseminating data on the web. Today, we are proud to present a new online web resource: the 3D Alligator. 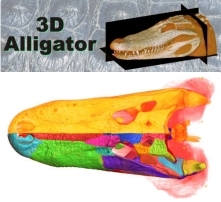 The Holliday Lab and WitmerLab are co-hosting, and co-launching new, complementary sites which offer new 3D models of skull and soft tissue elements of the American Alligator (Alligator mississippiensis). Our site hosts models of an adult alligator; Witmerlab hosts new models of a hatchling alligator as well as other goodies from past papers. Sample image from 3D Alligator, one of my favorite elements. Both offer 3D pdfs, Quicktime movies and numerous other features. 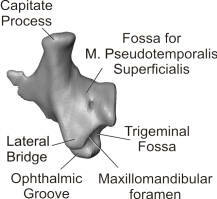 In particular, the Adult Alligator has separate pages for every element of the skull where there are Java-based Wirefusion models and labeled jpg images (visit the Laterosphenoid page). 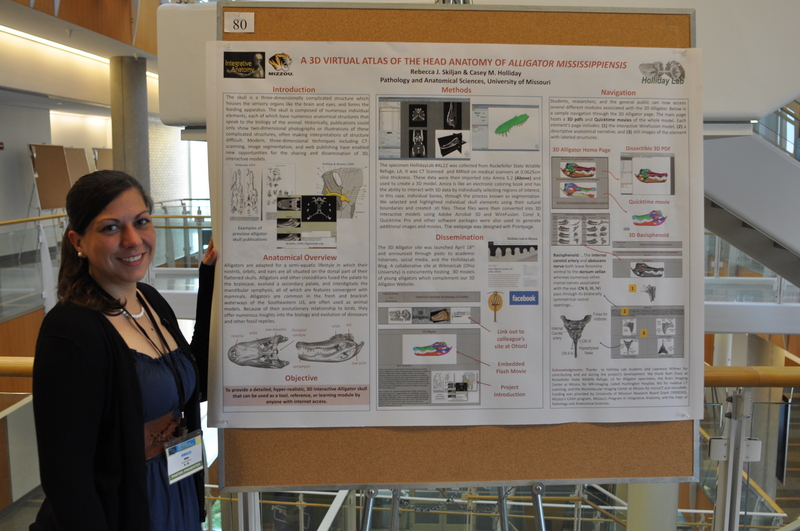 There are numerous structures and minutiae (to some) that were not labeled, and there are limitations to what 3D models of a medical CT dataset can show in web-friendly, smoothed format, but hopefully this is the next best thing to having a disarticulated alligator skull in your hands. Most of the work on the Holliday Lab page is thanks to the efforts of Undergraduate Lab Assistant and now Hughes Research Fellow Rebecca Skiljan. Becci has been working on this site since early Fall 2010. Every student who comes through the lab learns the basics of digitally extracting parts of CT or MRI data to aid various ongoing analyses–this one took on a life of its own. Thanks to this experience, among other things, Becci was awarded a prestigious undergraduate research fellowship to employ her skills in a project on the feeding mechanics of a fossil crocodilian during her senior year. Go check out the site! Please come back with you comments, ideas for additions, or any problems you may have. We expect the site to grow with some upcoming additions. This entry was posted in public education, Research News. Bookmark the permalink. Is there a way to down load in one file a poster type image of the whole bottom of the webpage “individual pages….elements?